The European seabass has a lot of names. For example, it is known as Dicentrarchus labrax, sea dace, Mediterranean sea bass, branzino or branzini, róbalo, lubina, spigola, ragno and loup de mer. European seabass is one of the most important commercial fish in the Mediterranean. You can find the sea bass in the eastern part of the Atlantic Ocean, which is known as FAO fishing area 27, and in the Mediterranean Sea and the Black Sea, which are known as FAO fishing area 37. The European seabass was one of the first types of fish to be farmed commercially in Europe. We also have our sea bass farmed in the countries Turkey and Greece, but we provide sea bass which is caught in the North Sea next to the Netherlands too. Sea bass can be farmed as well as caught, but in general the market prefers to farm it since caught sea bass is really expensive compared to other fish because of its scarcity. Thereby, sea bass is also hard to catch. 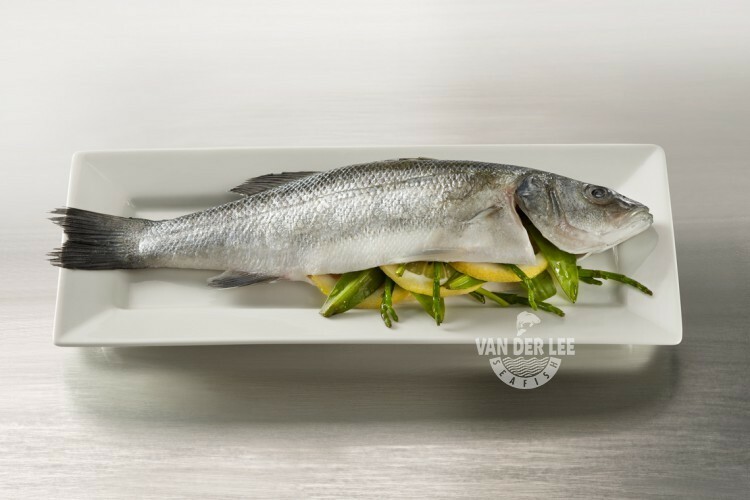 Van der Lee Seafish provides sea bass in all types. As a supplier we sell our sea bass whole round, battered, scaled, head on, headless, butterfly and gutted. We also have sea bass fillets available, which can be found as a product too at our ‘Fish Worldwide’-page. The European seabass has a silver colour and its back is dark. It has lean meat, which is white and delicate-flavoured, and it tastes delicious with sauce or lemon juice. The fish also contains few small bones and these bones are easy to remove. Like every fish, sea bass is a rich source of protein and it is also very nutritious. It contains only a little sodium and it does not contain any carbohydrates. Sea bass contains a bit of saturated and polyunsaturated fat. It only contains around 125 calories too, but a fillet of sea bass will contain more calories.We mainly export our sea bass to restaurants, schools, prisons, nursing homes, importers, wholesalers and retailers in Germany, England, Italy and Spain. Especially in the countries Italy and Spain sea bass is considered as a really popular dish. It is mainly used as main dish, but it can also be used as a party dish or a simple supper. In Northern Italy they use the name ‘branzino’ for the fish or the name ‘branzini’, which refers to multiple European seabass. In other parts of Italy sea bass is called ‘spigola’ or ‘ragno’. It also has a different name in Spain, where the fish is called ‘lubina’ or ‘róbalo’. In Italian and Spanish cuisines it is often prepared steamed, roasted, grilled, poached or braised whole. You can also prepare your sea bass in the oven, however when you do we recommend you to wrap the fish in foil so that the flesh does not dry out.